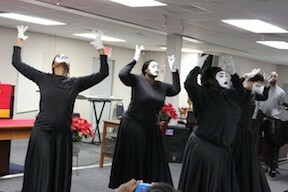 Expressions From the Heart is a group of believers who love to express our praise and adoration to God through mime. To be part of this ministry one must be actively involved in Bible Study, Sunday School and attend worship services and rehearsals regularly. Expressions From the Heart began at the Mount Ararat Baptist Church, Cardale, Pennsylvania in 1986 under the direction of Pastors Robert Shipman, Sr. and John Davidson. The original members were Pamela, Robert, Jr., and Shavonne Shipman. The group soon grew to 10 additional members and began ministering throughout Pennsylvania, West Virginia, etc. Pastor Shipman was called to the Prince of Peace Baptist Church, Philadelphia, PA in 1991 and soon established a mime ministry. This ministry has sponsored drama workshops, facilitate mime workshops in churches across the region and has toured in cities such as Pittsburgh, Philadelphia, New York and Grand Rapids during the course of our history. We thank God for using us as vessels to spread the Gospel through mime. Please continue to pray for us in this ministry. If you would like to receive more information about Expressions From the Heart, please feel free to contact Shavonne Shipman-Cook by using the information listed below. We pray God's continued blessings for you!